In my job, I travel to a lot of places, and often look for quilt stores when I have time. in one of those little, out-of-the-way stores, I found several quilt patterns that I wanted, as well as some beautiful fabric. When I got home, I put it away for several weeks, then got one of the patterns out to look at. It has the usual "... cannot be copied or reproduced in any way without written permission from the designer...". Ok, I get that. But the pattern that I thought was a quilt pattern, is actually a cd for embroidery. It has been several weeks, as I said, and honestly don't even remember where I bought it, so I can't try to return it. I could probably figure out how to get a reasonable pattern from the pictures to be able to make the quilt, but does that infringe on the "... not reproduce in any way..." thing? the copyright is applied to the pattern itself....whether a printed pattern, cd or embroidery program, you cannot make a copy of the pattern and sell it....but using the pattern to create anything is completely legal. Sorry, it isn't exactly like that. If the design itself is original, it cannot be copied. But copyright is a very murky issue. Why not just send a note to the designer and ask for permission? Last edited by dunster; 06-24-2013 at 08:55 PM. www.tabberone.com/trademarks/pattern.shtml should take you to a website that will explained what copyright are and are not. What the owner/seller/buyer rights are. Much has been written about this subject on this and many other "craft/sewing/embroidery forums. Some correct, most not. I was very surprised after reading these articles. This subject has been written about on this forum as late as last week. I actually found the Tabberone website by accident several years ago when my husband was seeking answers concerning copyright and patent questions. Very interesting reading. Not to chastise anyone, but False or misleading information, even given with good intentions, is still false information. Always consult your attorney when seeking legal advise. Be aware that the information on the Tabberone website is merely one person's opinions and experiences. She is NOT an attorney, nor does she claim to be. She is simply an eBay seller who has been sued multiple times for copyright infringement and has made a name for herself by publicizing her experiences. Her information can be just as false or misleading as anyone else posting here. I agree with dunster, contact the designer if you have any questions or doubts. you bought it, of course you can make a quilt from it. even if you can't "read" it. Go for it. You can get a copy of copyright laws and read them for yourself. I have done that in the past. Not sure where it is right now, to quote it, but I do remember that if you create a design, which is inspired by someone else's copyrighted design, and yours is still recognizable as having come from that other person's original copyrighted design, you can not claim it as your own, nor can you make copies of it. It is protected by the first person's copyright. May people believe if you change any one little thing about someone else's design, you have not infringed on their copyright, and that is just not what the law says. If you bought the copyrighted pattern, of course you can make something from it, and can change it to suit yourself, but you still may not make copies, for yourself or anyone else. Something else which many people misunderstand: they think it is permissible to make copies of copyrighted material and distribute those copies as long as you do not profit from them (charge a fee). That is not what the laws say. The copyright laws simply say only the owner of the copyright can make copies of the work. Period. It says absolutely nothing about money. And only the copyright owner can further develop their design into another design, or display the work publicly. That's what I remember, anyway. [QUOTE=ghostrider;6142390]Be aware that the information on the Tabberone website is merely one person's opinions and experiences. She is NOT an attorney, nor does she claim to be. She is simply an eBay seller who has been sued multiple times for copyright infringement and has made a name for herself by publicizing her experiences. Her information can be just as false or misleading as anyone else posting here. You are correct, she is not an attorney, she represents herself and her experiences only. But the designer may not understand the law and just because the designer put that fancy disclaimer on the bottom does necessarily make it so. The idea of purchasing something and being told you cannot use it for what is was intended (purchasing a pattern, book, design etc) is different than purchasing that item and then passing it off as your own. Using the pattern for it's end result (making the quilt) is different from buying the pattern, making copies, then selling it, (either for sale as if you were a distributor or claiming it is your design and selling it outright as your own). That might be against the law, and the original designer may have the right to prosecute and be compensated. I think that is where the whole issue of "copyright" becomes distorted, as to what is "copying" and what is "end use". The original poster was not saying she was going to copy the cd for the purpose of selling it as her own, she said she wanted to make the quilt that as pictured on the cd. Now, was the quilt original to the designer or were the embroidery designs original? Now, dealing with our court system, is a another issue. You have the right to sue anyone, winning and restitution is another matter. Unfortunately, the wronged party can jump up and down, scream and cry foul, but unless you have the time and money to pursue a case you may be out of luck. Is this right? No, but that is what happens, like it or not. And if you find an attorney who takes the case and works for you, you still have to prove your case and you may not win. If you do win, you may or may not be awarded any compensation. If you are lucky and win you then get to satisfy that judgement. The judgement means you have the right to pursue collection, but collecting that settlement is another thing. Just because you have a judgement, does not mean the other party is going to pay up, you may have to sue to get that. And of course, the attorney will most likely take most of the judgement as payment of services and costs incurred trying the case ( if it even gets that far). Either win or lose, it costs both parties. All boils down to not who is right, but who the court thinks is right. And "right" and "fair" has nothing to do with it. There is no "justice" in our justice system. Laws are written and broken, or interpreted, as courts see fit. I am not saying the designer should not be righted. Just saying that because you claim something, it may not be so. This is, of course, just my opinion and from personal experience of being sued and suing. I believe that with most patterns it allows you to copy a pattern but for personal use only. I wouldn't lose any sleep over making a quilt from any pattern I bought from a retail store. Actually you can call the US Copyright office and ask them. Excuse me, why is she selling anything that cannot be used! Ridiculous. The embroidery cd is sold to use, not to look at. You purchased the right to use the design, so use it. Don't copy the cd to sell. No one is going to police your using the embroidery design in a quilt, purse, or clothing. Case closed. Every quilt cd I have has that same warning. I will give the cd to someone when I'm done with it but I don't destroy the pattern I printed out from it to make a quilt no more then I would destroy the quilt I made from the printed pattern. While she isn't an attorney, she has been to court and won. There are also numerous cites of various court cases and supreme court decisions on her website. It's not just opinion. If you are going to make a quilt, only for your personal use there probably will not be any problem. A problem could arise if you make a quilt, and then decide to enter it in a quilt show, where it could be photographed, and somehow, the designer of the cd recognizes the pattern if she would see a picture of the quilt. Even if has been altered, it could be a problem for you. You may wish to contact the designer and ask to be sure. [QUOTE=Bneighbor;6142288]www.tabberone.com/trademarks/pattern.shtml should take you to a website that will explained what copyright are and are not. What the owner/seller/buyer rights are." OMG. I just checked out this site. What a nasty site! I really question any info given on this site due to how negative it is. These people sound like sore losers. Do not cross these people or you may find yourself blacked balled and listed on this site. I've wondered about this myself quite a few times. I make all my own patterns but I take ideas from other quilts I've seen before. The quilt that's currently on my bed was made by mixing two quilts that I found pictures of online and using the applique templates that I found in a quilting book that I own (bought in a second-hand store). I did all the math myself and decided how I wanted to include ideas that I found on those pictures, but I never claim that I came up with it all on my own. Another thing to think about is that if you're making this for yourself or someone close to you, is it really going to get out there that you "stole" copyrighted material to create your quilt? Are there some "quilting police" out there that are going to confiscate your quilt? I don't think so. I would worry more if you wanted to sell the quilt later, or if you wanted to be in a national competition, but for personal use, you're probably fine. Of course, this is all in my own opinion. I hope nobody here will turn me in to the quilting police! 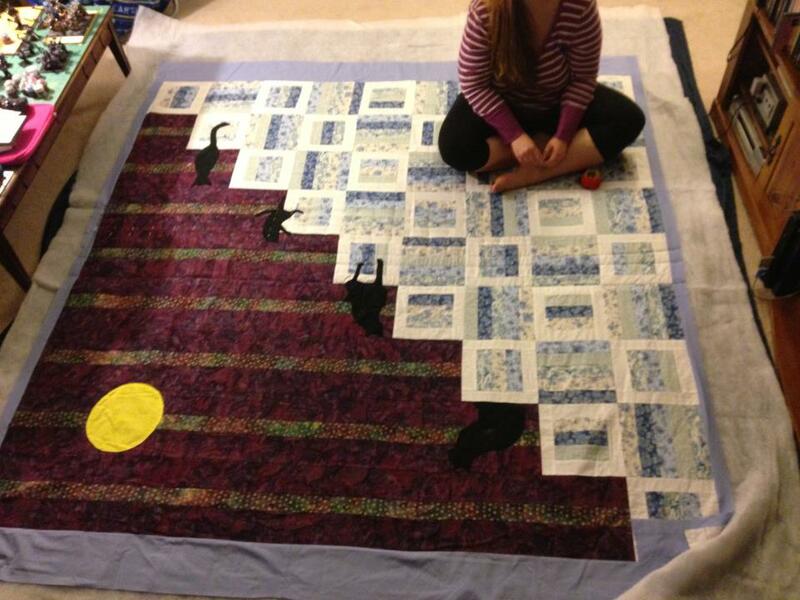 I love my cat quilt and I worked for hours and hours on it! Since when is it nasty to stand up for yourself and not back down to bullies?? That's what most of these most of these "restrictions" amount to-bullying. Just because they say it does not make it law. www.tabberone.com/trademarks/pattern.shtml should take you to a website that will explained what copyright are and are not. What the owner/seller/buyer rights are." How cheerful and happy do you think you'd be if you'd been dragged into court for something you didn't do? I think a big problem now-a-days that I worry about sometimes is that you don't know where something originated. The internet is so full of copies of things that you could take an idea from one place but the original owner of that idea is linked after going through 4 or 5 pages. You really notice this on Pinterest! This site is way past "uncheerful" and also is past the border of foul and hateful! This is just another trash site! With a lot of embroidery pattern & designs, you have to open it & print it. How are you going to get the directions.? Most are in PDF form. Just finished printing off directions. When the embroidery CD first came out they containd info. Now they don't & you have to print it off. At the risk of repeating what other threads on this question have said: I am an embroidery pattern designer, and sell digital patterns, which means you need to print them out to use them. How on earth could I ever accuse someone of a copyright infraction for printing out a pattern that must to be printed out in order to be used? It would be the height of silliness. Patterns are meant to be used. Period. No author has the right, under international copyright law, to prevent you the buyer from doing whatever you want with the product of your labor. In other words, the quilt or the embroidery you make is yours to do whatever you want with. It's always nice manners to credit the designer but even that isn't compulsory. Copyright protects the author of words and pictures (i.e. the pattern instructions) from having them copied and passed off as someone else's. So what you cannot legally do with my pattern instructions (words, pictures) is copy and sell my pattern with your name on it, or copy-paste it somewhere public and pretend you wrote it. This subject is getting old! Im glad the original poster identifies the subject so I can just skip over it next time. Rehashed over and over too many times. The best answers can be found by googling and going right to the government site therefore avoiding amateur opinions instead of facts!